This 1940s Retro Modern large citrine brooch is fantastic. This large, appx 27 carat, amber colored citrine is centered between three twirling ribbons of 14kt rose gold. This flashy brooch measures 2 inches wide. 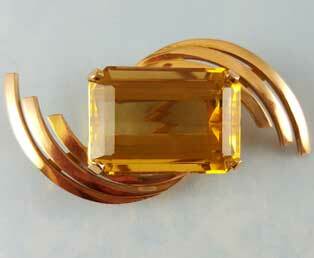 This 1940s Retro Modern 27 carat citrine brooch is in excellent condition.